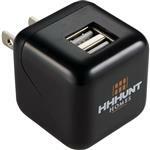 The 4 port USB wall charger - great for home, office or travel. 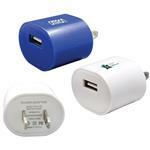 Conveniently charge up to four different power devices at one time, with your own USB cable. Works great with phones, cameras, MP3 players, iPods, etc. 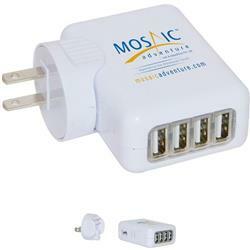 Four port USB charger. Blue indicator light turns on when plugged in. Input: 100V-240V AC. 300 mAh. Output: 5.0V, 2.1 A. The big boy of wall chargers! Typical Imprint Area(s): 1-1/4" (w) x 2" (h). 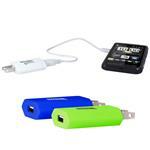 Conveniently charge up to four different power devices at one time, with your own USB cable. Works great with phones, cameras, MP3 players, iPods, etc. Four port USB charger. Blue indicator light turns on when plugged in. Input: 100V-240V AC. 300 mAh. Output: 5.0V, 2.1 A. Note: If the items you are charging need more than 2.1 A of power, the unit will stop working to protect itself from overheating.